The Port of Antwerp and the Port of San Pedro in Co^te d’Ivoire are to collaborate over the next few years to manage further expansion of this West African entrepot. San Pedro, the leading cacao port in the world, aims to develop at regional level so as to become a logistics hotspot for handling commodities such as fertilizers, cashew nuts and cacao, among other things. To achieve this ambition, work will start next year on construction of a logistics platform under the name of ‘San Pedro Logistique’. Part of the capital cost will be financed by Port of Antwerp International (PAI), the consultancy and investment subsidiary of Antwerp Port Authority. While PAI has already been active in West Africa for many years now, this will be the first time it has made a financial investment in the region. 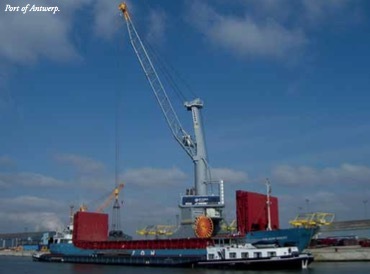 Already in 2011 the ports of San Pedro and Antwerp signed an agreement for collaboration between them. Since then the freight volume handled by San Pedro has expanded to 4.9 million tonnes annually, a master plan for development of the port has been drawn up, logistics zones have been developed and mutual promotion has been carried out. This positive balance has now led the parties to renew the agreement for a further period of five years. A new five-year Memorandum of Understanding was therefore signed on 1 September by Eddy Bruyninckx, CEO of Antwerp Port Authority, Kristof Waterschoot, director of PAI and Hilaire Lamizana, general manager of San Pedro Port Authority. In addition to supplying the necessary technical expertise for the development, the agreement also specifies that APEC, the training centre for the port of Antwerp, will hold two training seminars per year for San Pedro port personnel. One of the components of the master plan for development of the port of San Pedro is the creation of a logistics platform. The Belgian group Sea-Invest, which already operates in Co^te d’Ivoire in the port of Abidjan, will take the lead for this initiative. On Thursday this week Sea-Invest presented its detailed plans for the new platform, construction of which is scheduled to begin early next year. The overall price ticket for the project is €5.5 million, 35% of which will be financed by PAI. In exchange the latter will have two directorships in the company behind San Pedro Logistique.The platform is expected to be operational around the summer period of next year.“This is the first concrete investment by the port of Antwerp in West Africa,” says Eddy Bruyninckx, CEO of Antwerp Port Authority. “With this clear commitment we are emphasizing our belief in the potential of San Pedro. Its geographical location and its connections with Liberia, Guinea and Mali represent enormous potential benefits for Antwerp which is already the market leader for West Africa,” he concludes.